There are many ways to live life. 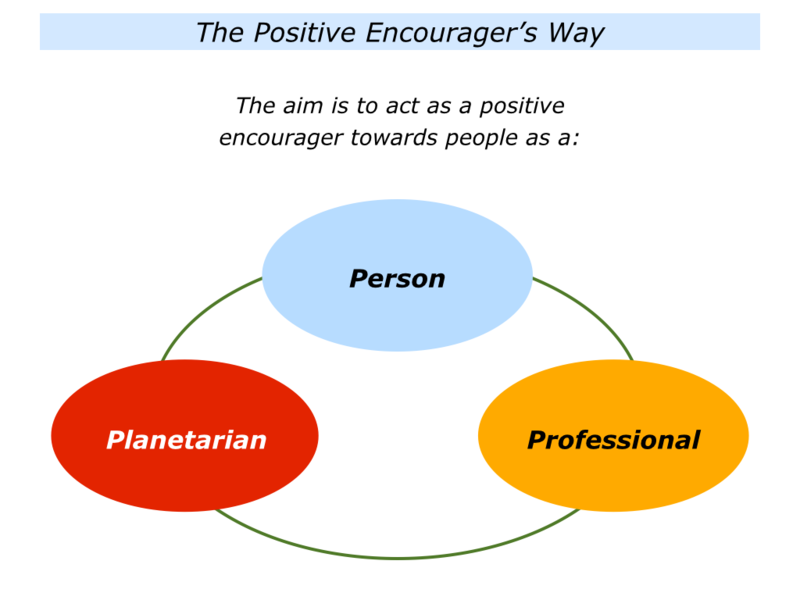 One approach is to be a positive encourager as a person, professional and planetarian. Let’s explore how people translate this approach into action. 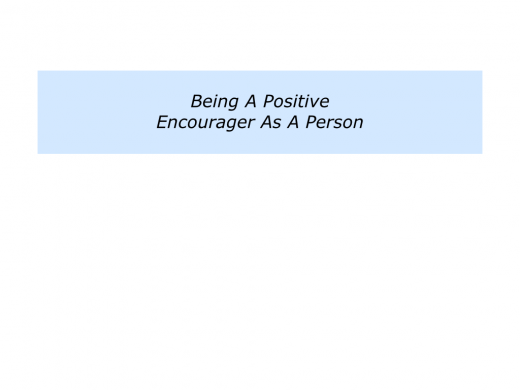 Looking back, who have been the encouragers in your life? You may have had an encouraging parent, friend, teacher, sports coach, leader or whatever. What did each of these people do to encourage you? How did they offer support? If appropriate, how did they pass on knowledge you could use in your own way? Good encouragers are like good parents. They are positive, predictable and create an environment in which people feel at ease. Some have positive eyes. They look for when people come alive and encourage them to do more of these things. Some also demonstrate the characteristics of trusted advisors. Looking back on your life, can you recall a person who at some point acted as a trusted advisor? They may have been an expert in finance, medicine, business, counselling or some other field. How did they help you to feel at ease? How did they clarify the goals you wanted to achieve? How did they then pass on their knowledge in a way that you could use? 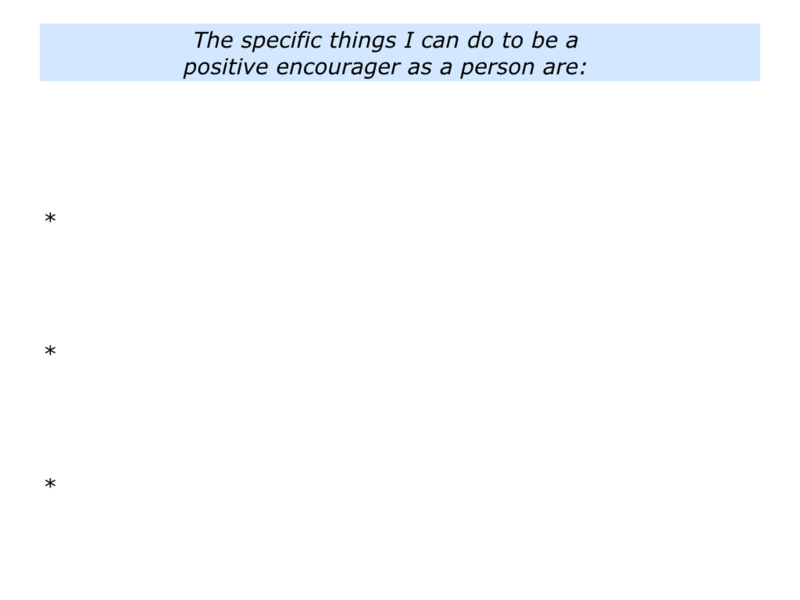 Below are some of the answers that people give to these questions. They explained the various roles – their role, my role and other people’s roles – as we worked towards the goals. They then used their knowledge and skills to do their best to help me achieve my picture of success. Different people choose different ways to encourage others. If you wish, try tackling the exercise on this theme. This invites you to describe the specific things you can do to continue to be a positive encourager as a person. Different people choose different ways to encourage others in their work. They may work in education, medicine, the arts, business, sports, social enterprises or another field. They often aim to build on their strengths and help other people to succeed. Susan Cain has used her strengths to show the value that introverts bring to organisations. She wrote the book Quiet: The power of introverts in a world that can’t stop talking. Below is a video in which Susan explains these views. You can discover more on this web site. “What differentiates Ashoka Fellows from mere idealists is that, for these rare men and women, an idea can bring satisfaction only when it is realised. By the end of their 5-year fellowship, between fifty and sixty per cent of the Fellows have changed national policy in the countries where they have been working, and ninety percent have seen independent institutions copy their innovations. Ashoka enables people to harness their inner strength and improve their local society. The video below provides an introduction to the organisation’s approach. You can discover more via the following link. 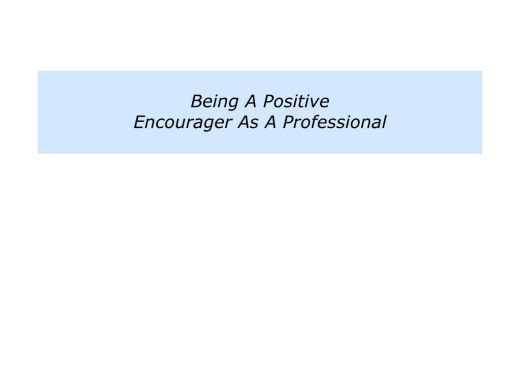 Different individuals choose different ways to encourage others in their work. They may choose to work as a counsellor, educator, inventor, business leader or whatever. If you wish, try tackling the exercise on this theme. This invites you to describe the specific things you can do to continue to be a positive encourager as a professional. Many people are doing pioneering work across the planet. At the time of writing, thousands are running social enterprises. These people are sometimes backed by organisations such as the Ashoka Organization, Echoing Green and the Unreasonable Group. At the same time, however, many people feel frustrated. They believe that human beings must shift their thinking to take the next step in evolution. So how can you help to bring about such a development? Each person will choose their own path, but here are two approaches. These are the pollination approach and the paradigm approach. People who take this approach aim to encourage other people and plant seeds of hope. They aim to do this by sharing positive models and showing that these produce positive results. They recognise that people buy success, rather than the theory of success. They therefore aim to spread success stories and – through the pollination process – help to build to build a better world. This approach has both pluses and minuses. The pluses are that it is based on success and provides practical tools that work. 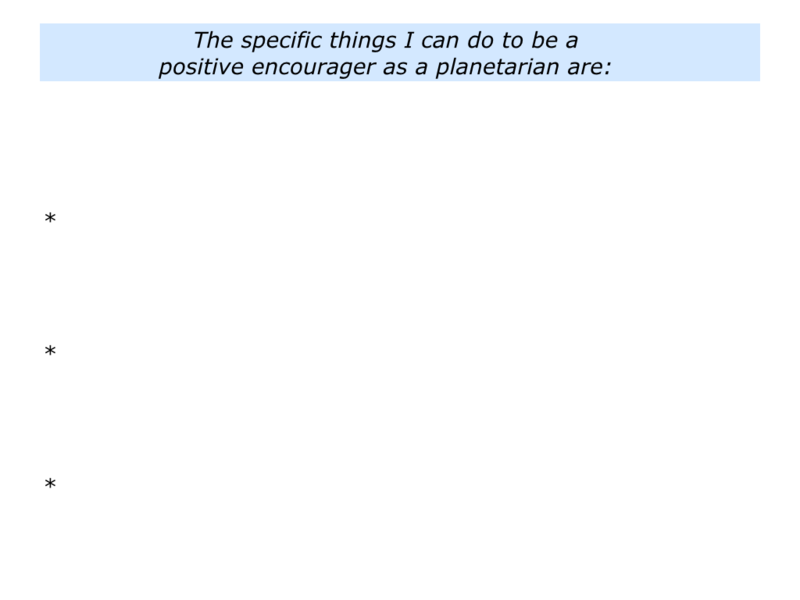 People are then more likely to pass on these ideas to others and help to build a positive planet. The minuses are that it takes a long time. Even if the seeds grow, people may still be living within societies that are not encouraging. People who take this approach recognise that people often have a certain paradigm – a way of looking at the world. This paradigm influences their daily actions. They therefore aim share a positive paradigm that other people can see is both practical and profitable – in the widest sense – for both present and future generations. Such people may show, for example, that it is both economically and environmentally profitable to pursue a certain path. They show how people can achieve sustainable success and help to build a positive planet. The pluses of this approach are that it shows a way of living that can benefit both present and future generations. The minuses are that it can come across as haranguing or preaching. Another minus is that it is difficult to encourage people to shift their belief systems. Confirmation bias tells us that people look for information that supports their present view of the world. People tend to ‘see what they believe’ rather than ‘believe what they see’. People are more likely to evolve, however, if they can see a practical way forward that will deliver success. Success provides its own arguments. Seeing what works can encourage people to adopt an approach that is likely to deliver positive results. Ellen MacArthur became famous for her round-the-world yacht voyages. She has now moved on to showing how it is possible to build a sustainable and successful economy. Whilst on the yacht Ellen became increasingly aware of environmental challenges. This led to her focusing on the need to live with just the resources available and to cut out waste. Ellen began exploring the concept of the Circular Economy. Here is an introduction from her Foundation’s web site. A circular economy seeks to rebuild capital, whether this is financial, manufactured, human, social or natural. This ensures enhanced flows of goods and services. The system diagram illustrates the continuous flow of technical and biological materials through the ‘value circle’. Below is a video in which she describes the approach. You can discover more via the following link. 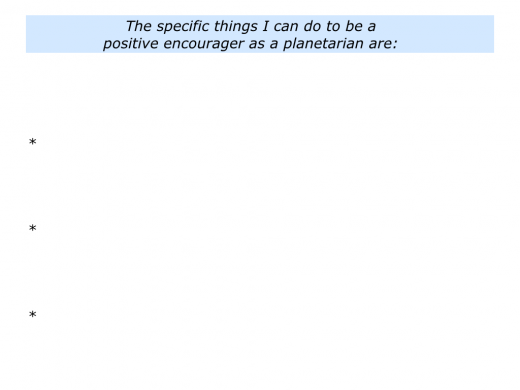 Different people choose different ways to encourage others during their time on the planet. You will, of course, choose you own way. You may choose to work as a counsellor, educator, inventor, business leader or whatever. If you wish, try tackling the exercise on this theme. 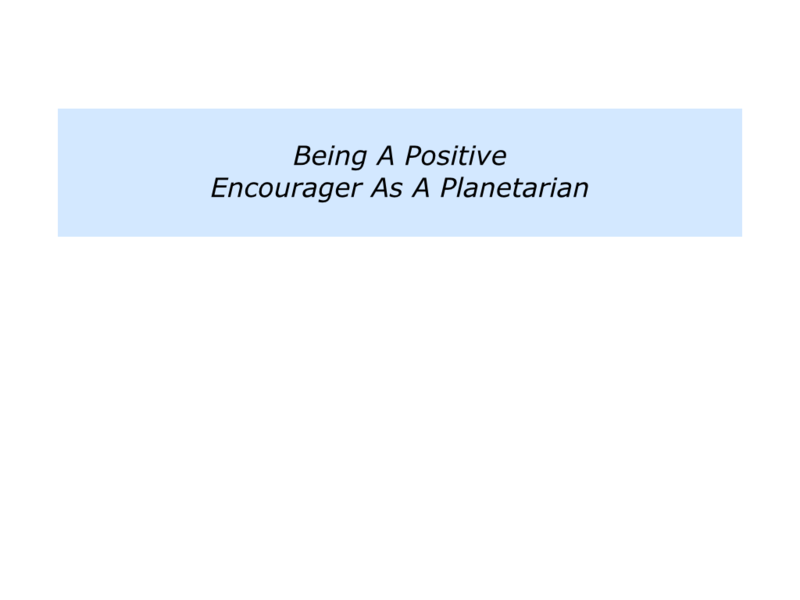 This invites you to describe the specific things you can do to continue to be a positive encourager as a planetarian.